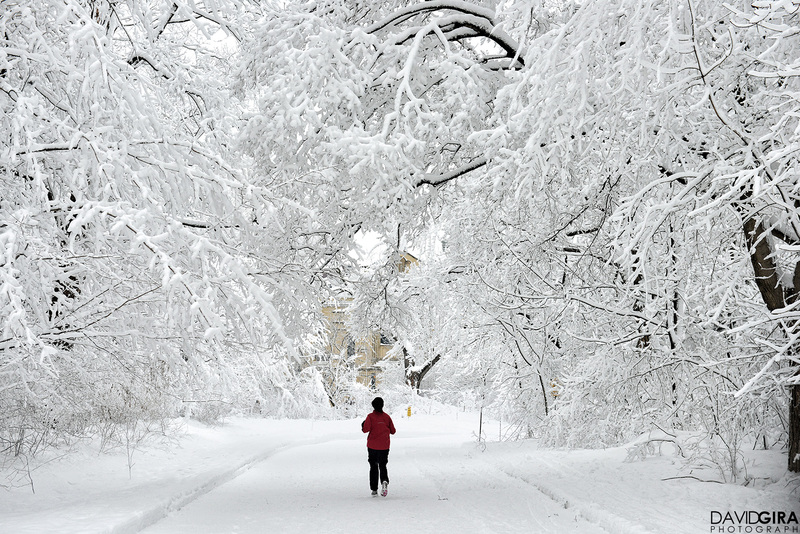 There is always something magical about winter in Montreal. And once in a while a curious phenomenon arises. 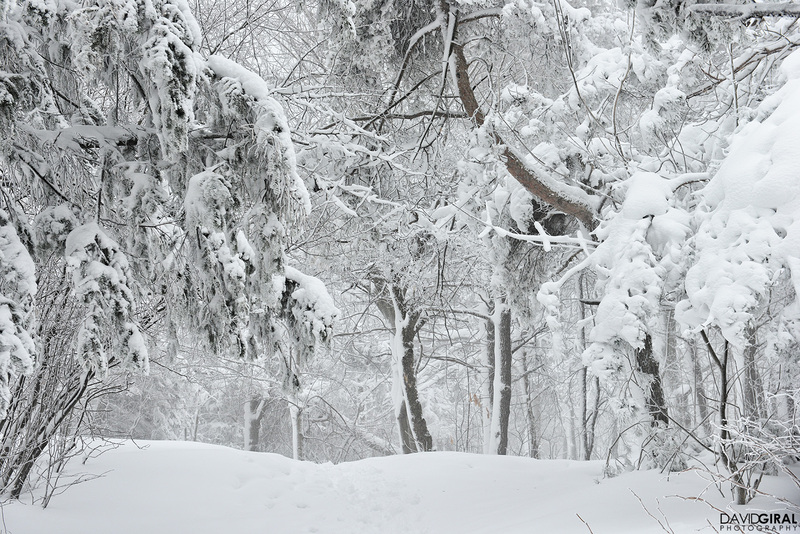 After a few days of a mix of snow and rain, something enchanting happened. 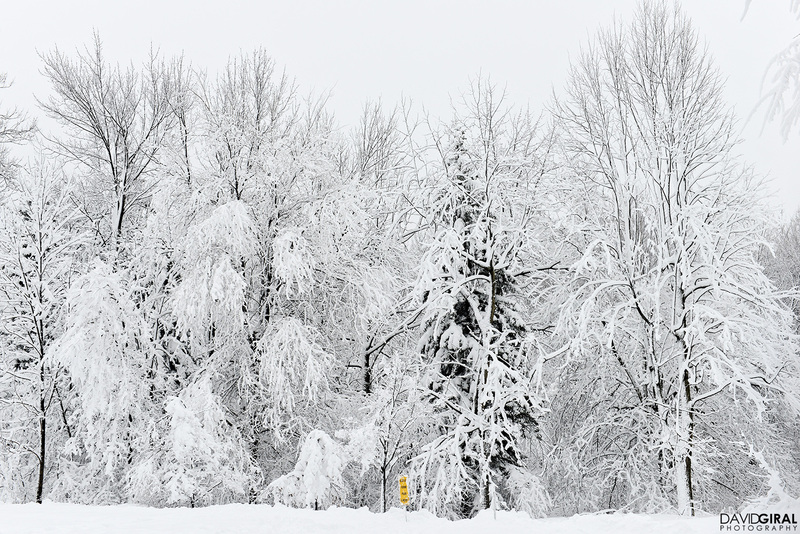 You woke up in the morning only to discover that the trees and streets are covered with a thick layer of snow. It’s so extraordinary that I had to take my trusty Nikon D800 with my Nikkor 24-70mm F/2.8 G ED and go on a long stroll. 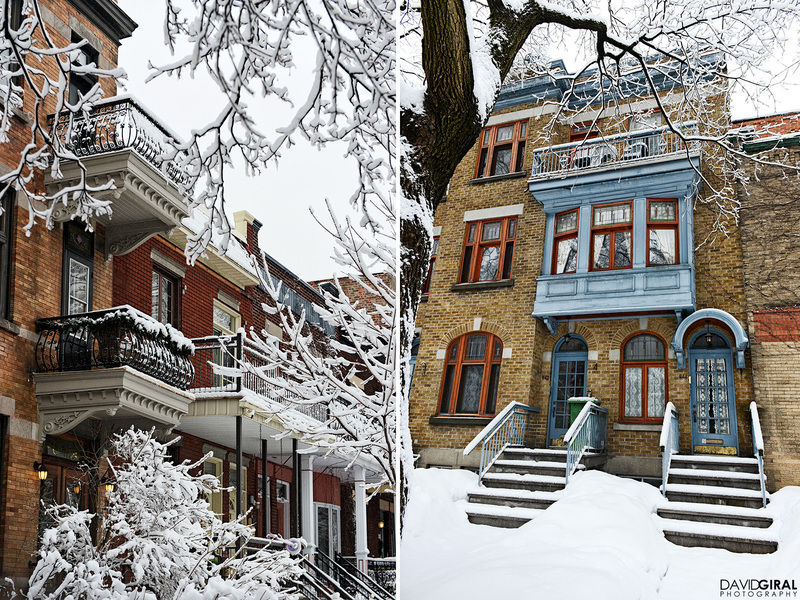 So down I go, strolling into the streets of Outremont, a beautiful district of Montreal with beautiful classical homes from the turn of the last century. 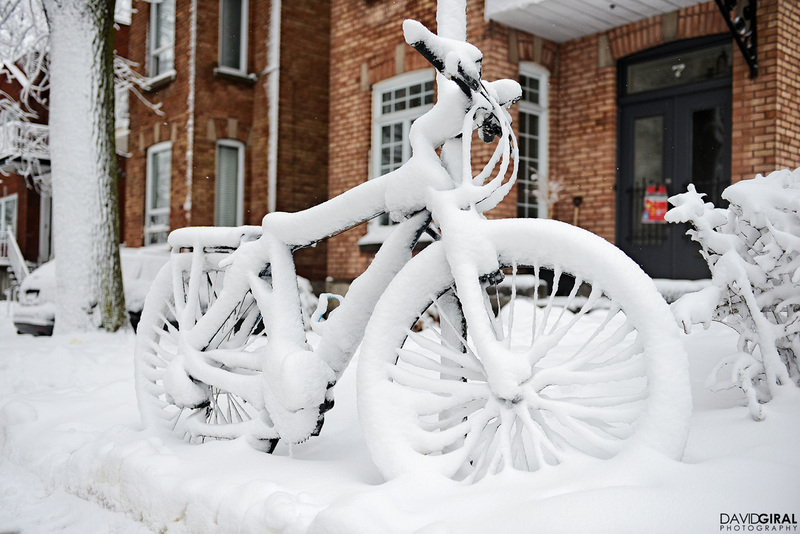 Then a bit further, I find myself dazzled by this snow covered bicycle, it just seems you could take a ride on this magical snow bike! Well, I had to pass on this opportunity, because what a bike is good for if you have not seat! 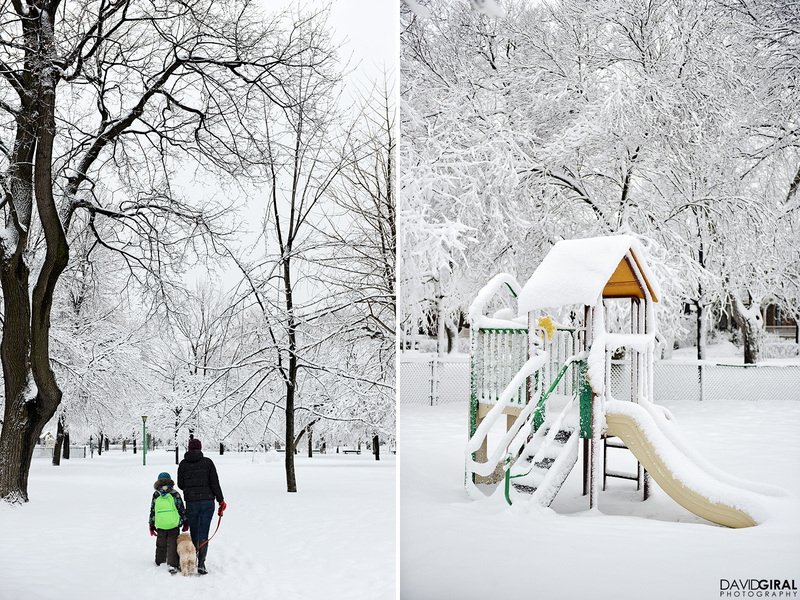 Located in the heart of Outremont, Outremont park is a beautiful little place to go with your family or to walk your dog, and with all that snow, it just feels it’s just out of a fairy tale. 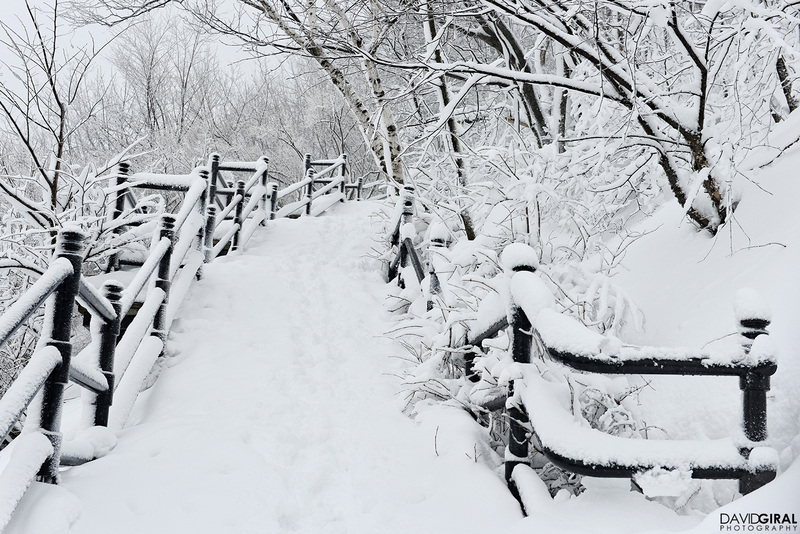 You can even see people contemplating the amazing spectacle in front of them and appreciate this opportunity to take a moment and appreciate this Winter wonderland. Then, just a few blocks away, one of Montreal jewels Lies. Mont Royal Park. 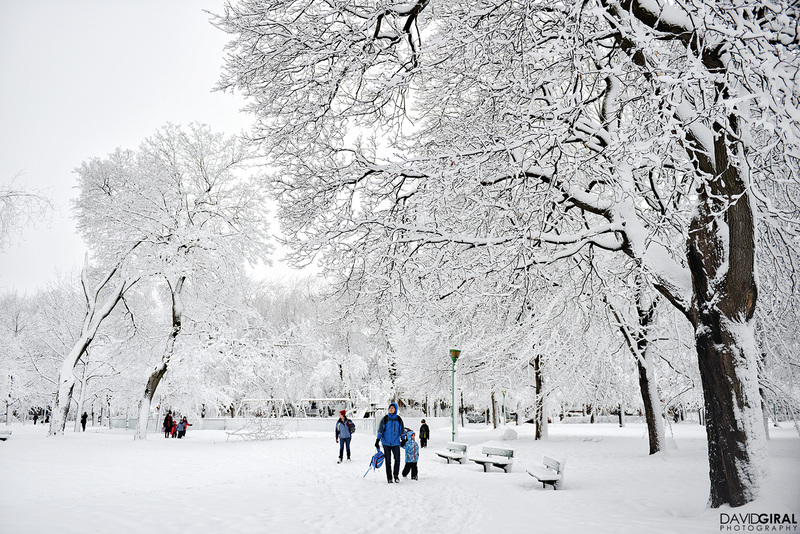 The park was designed by Frederick Law Olmsted, who also co-designed New York‘s Central Park, and inaugurated in 1876. 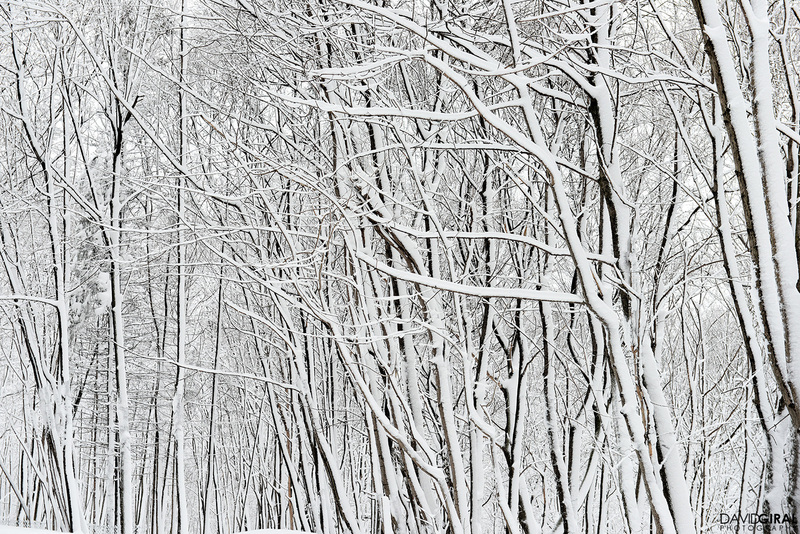 In that morning of February, the forest wasn’t a green jewel rising above downtown Montreal, but a white one. 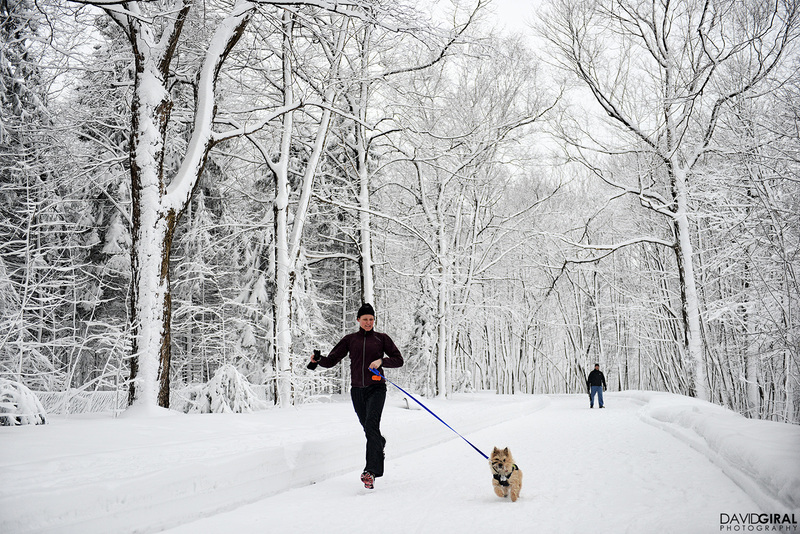 If you ever visit Montreal, the Mont Royal park is the place to go jogging, crosscountry skying or simply go on a stroll with your dog. 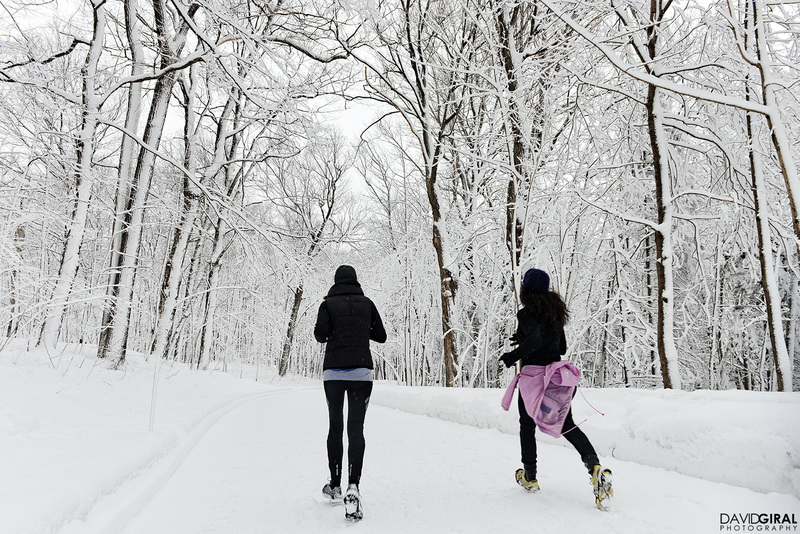 I’ve always loved running and seeing those two women jogging in the park really made me itch to go on a run! 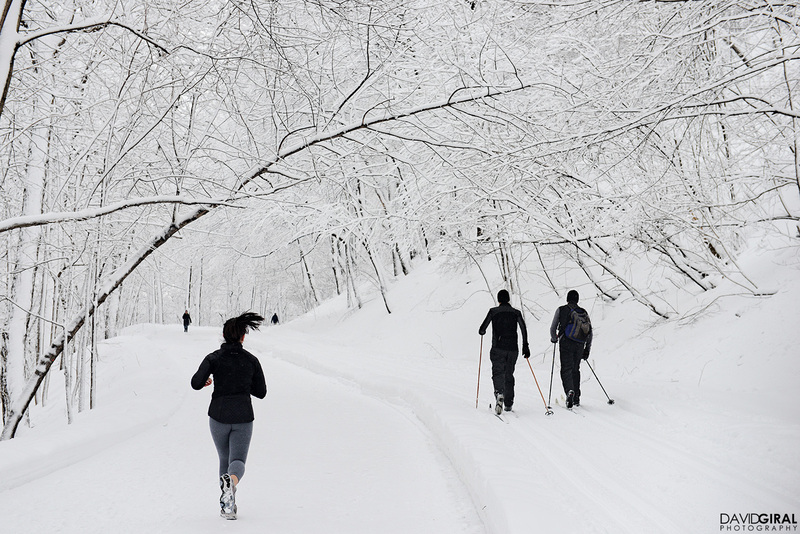 What’s remarkable about Mont Royal Park is that you can go off the main trails to find yourself lost in the woods, not aware that you’re just a few miles away from the heart of a busy city. 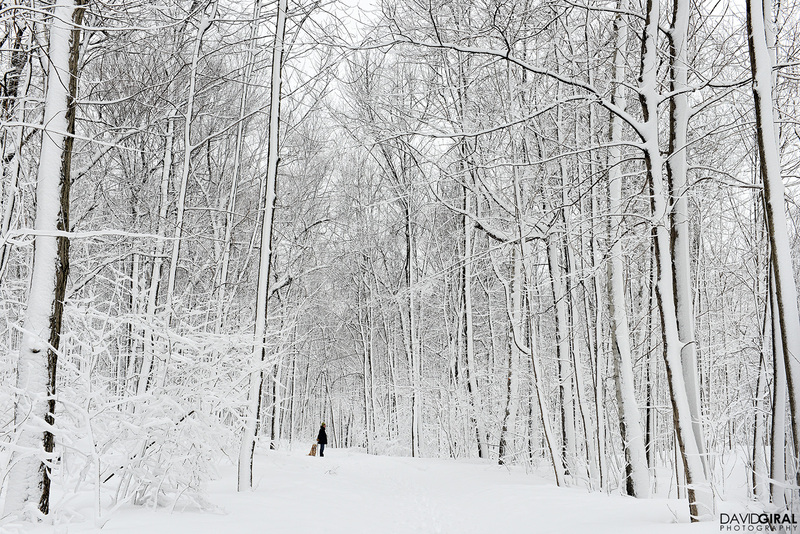 This picture of a man and his dog reflects that moment of peace and appreciation you feel when you are alone in the nature. 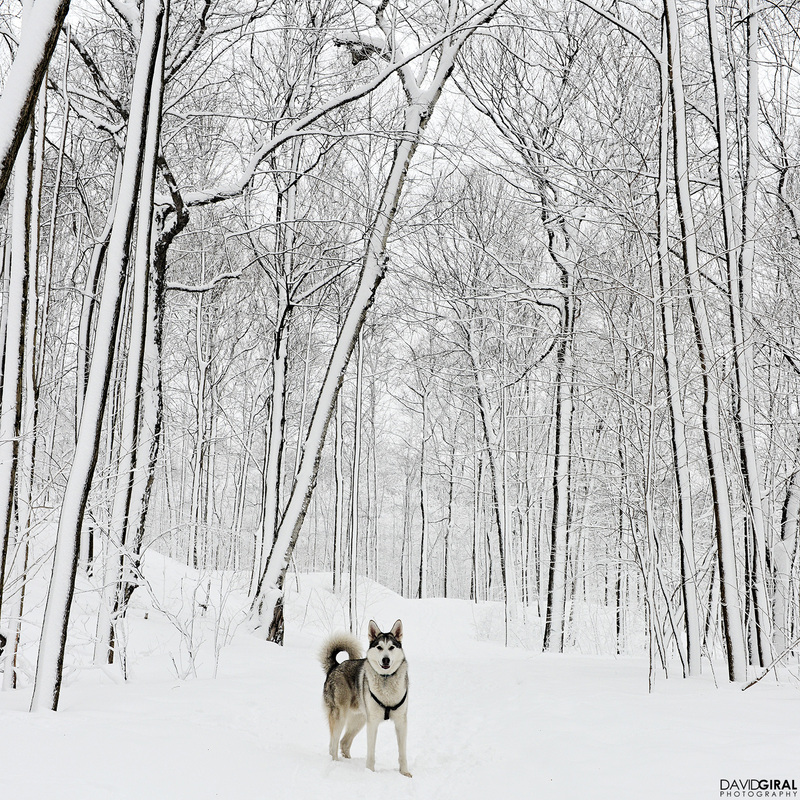 It’s also a paradise for dogs and this husky was really excited to enjoy the freedom of being in the snow. And the more dogs, the merrier! 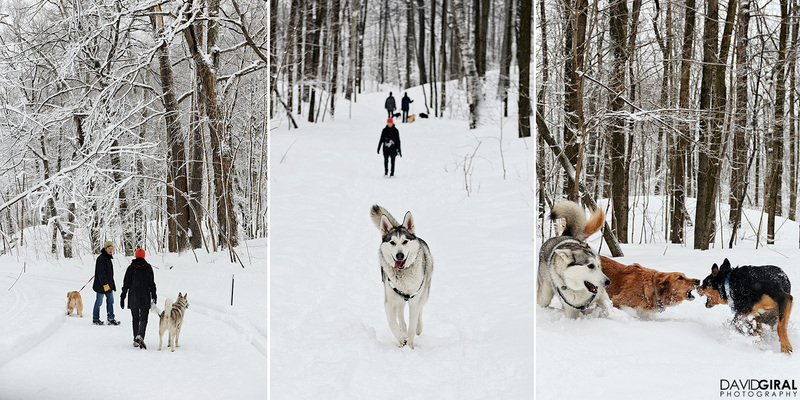 It’s such a treat to watch dogs enjoying themselves, playing and chasing each other in total freedom! Then, going up the stairs into the fog and the misty morning, I wasn’t about to be let down by my visit to the park. This scene is so magical, I love this picture of the forest lost into the fog, it feels like it straight out of a movie, just waiting for the Red Riding Hood to appear in the picture. 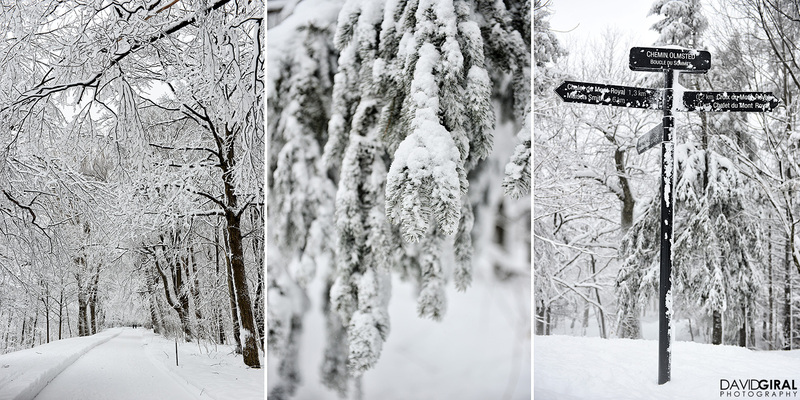 The beauty also lies into the details of this trails, and the delicate snow covering the sign posts and the trees. 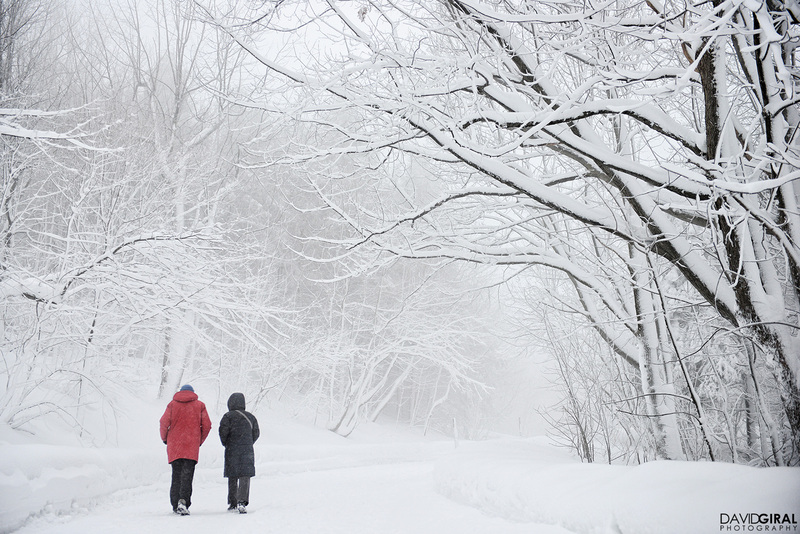 And how romantic it is to witness this couple climbing up the trail leading to the Mont Royal Cross. 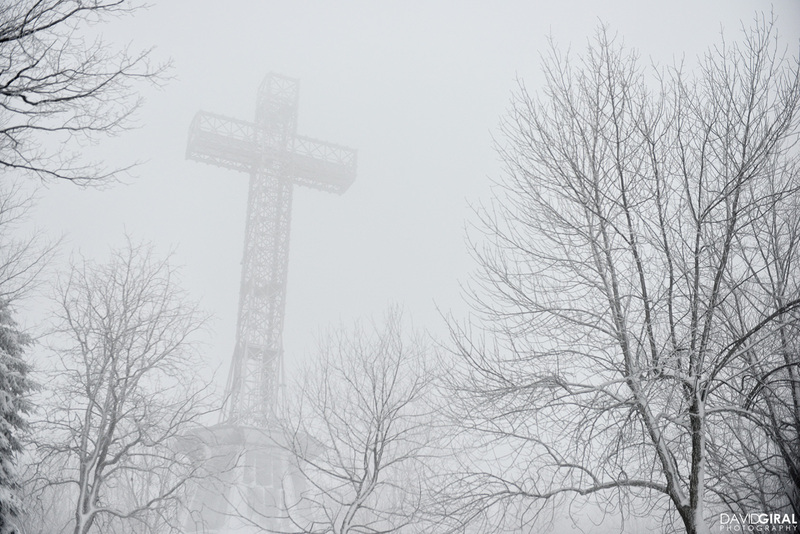 The cross, installed in 1924, was converted to fibre-optic light in 1992, and then to LEDs in 2009. Even with the foggy weather, it looks majestic! 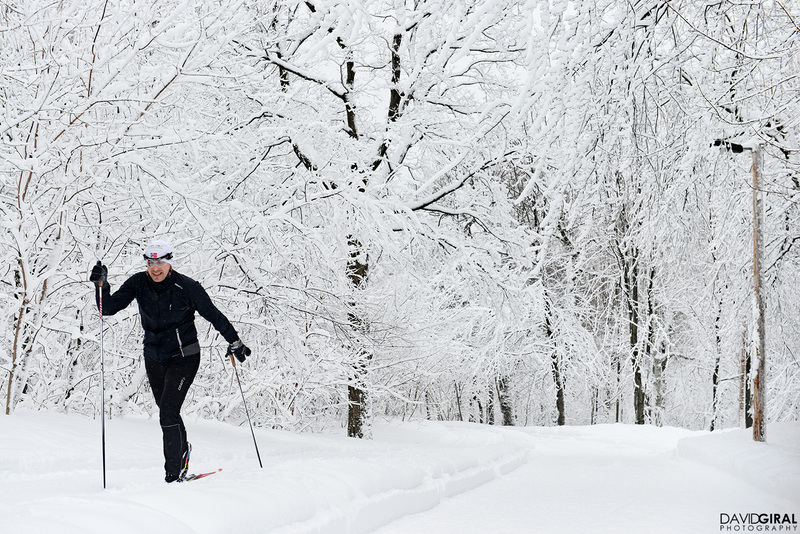 As mentioned before, the park is the best place in Montreal for cross-country skying with 22km of trails! So I hope you enjoyed your visit! See you soon in Montreal! 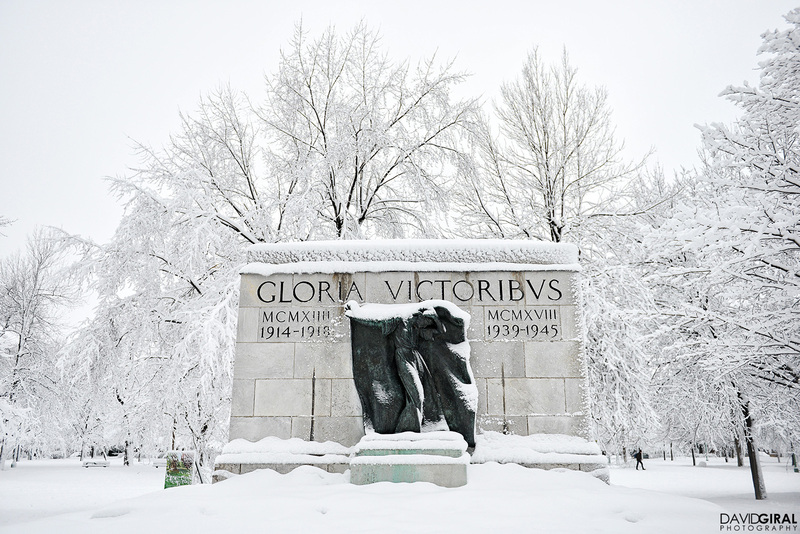 Oh and if you have a moment to check those Montreal Photos on Fine Art America, I would be really grateful!